After 6 years of selling grapes to other wineries, Jay Wilderotter started making his own wine, but had no tasting room or distributors. Selling the wines strictly through family and friends, they quickly sold out, and Jay was able to open his own tasting room in 2005. 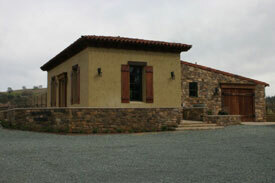 A small but beautiful mission style building, Wilderotter is surrounded by 25 acres of vineyards. The winery also has patios featuring several picnic tables and umbrellas that allow you to relax to the sound of falling water from the nearby fountains. The 40-acre estate has 25 acres planted in vineyards. There are 10 acres of Zinfandel, 8 acres of Syrah, 3 acres of Viognier, with the remaining 4 acres in Petite Sirah, Sauvignon Blanc, Grenache and Mourvedre. The winery’s main focus is on the Rhone varietals and Zinfandel, which are favorites among many of the winery's enthusiasts. For such a small winery, they have done exceedingly well in the wine competition arena, winning Best of Show, Best Red for their Barbera at the 2007 California State Fair, as well as Best of Class for their Sauvignon Blanc and Zinfandel varietals. Jay Wilderotter was an Air Force Pilot who took night classes at the University of California, Davis, in enology. While stationed at a Sacramento Air Base, he found the property in Amador and purchased it for a vineyard site. After the family moved to Oakland, Jay traveled back and forth between the family home and the vineyard, working to plant the vineyards and establish the winery.